If you’ve visited the farm recently, you may have noticed that the Discovery Centre is looking a little quiet. There will be some changes in the animal village over the next few months, and some of our smaller, furrier animals will be going to retirement homes. However, we’re really excited to announce that we will be using this space to develop our hatchery. At the moment, we have one incubator. This keeps the eggs at the right temperature (37.5°C for chicken eggs) and keeps the air moist enough (around 50%) so that any fertile eggs should hatch in around 21 days. Our incubator can also roll the eggs, which replicates the way that the mother hen would naturally turn her eggs on a regular basis. 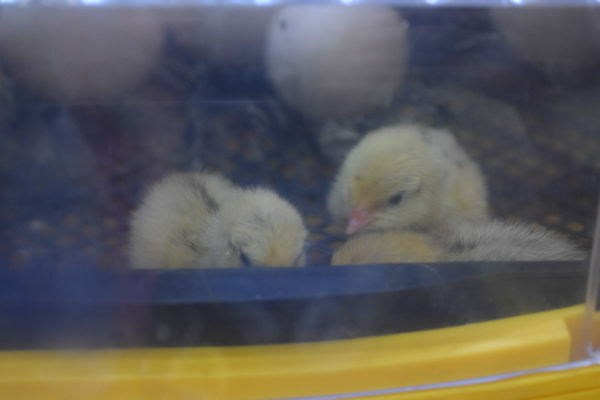 With the development of the hatchery, we can have chicks and ducklings all year round. From polish bantam chickens to quails to New Hampshire reds, there will be more feathered friends at the farm when you visit next. If you’ve thought about keeping chickens, ducks or other type of poultry then watch this space.